Want to lose your belly fat? Yearning for a flat, six-pack abdominal area?MayoClinic.com notes that abdominal fat not only makes your waistband tight, it can also harm your health. Fat in the abdominal area in particular has been linked to an increased risk in diabetes, heart disease, colon cancer and other diseases. The key to dropping belly fat and whittling your waistline could be your diet. Adding certain foods to your balanced daily diet can help burn fat and flatten your tummy faster. 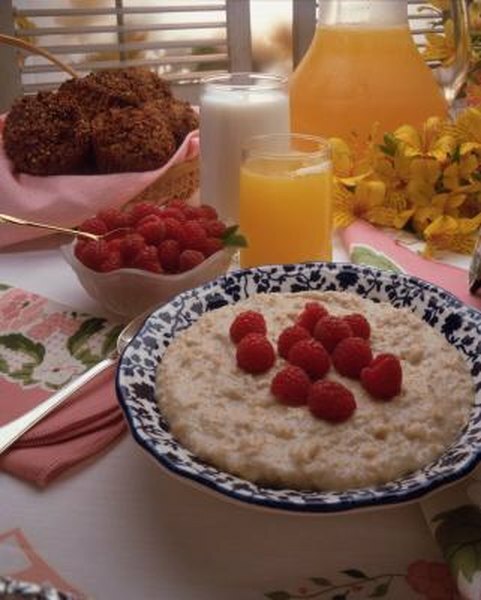 Thick, hearty oatmeal is loaded with fiber, which helps stave off hunger by slowing digestion. Plus, fiber moves waste through your body, helping to flatten your stomach, according to registered dietitian Sari Greaves, a spokesperson for the American Dietetic Association. Steer clear of instant flavored varieties, which have added sugar. Unflavored rolled oats will help you slim down faster. "The more unrefined the oatmeal, the more fiber it contains," Greaves says. Almonds are a superior source of alpha-linolenic acid, a substance that accelerates metabolism of fat, according to Greaves. In a 24-week study comparing almond eaters and non-nut eaters published in the “International Journal of Obesity and Related Metabolic Disorders,” those eating 3 ounces of almonds daily reduced their weight by 18 percent, while the no-nut group lost only 11 percent of their body weight. Just be sure to snack on salt-free varieties. Salt can cause puffy water weight, leading to a bloated stomach. The calcium in dairy products has been linked to weight reduction in a number of studies. Calcium may help to erase belly fat by reducing enzymes related to the production of fat, according to Greaves. This, in turn, can prevent fat from forming in the first place. Swiss cheese has more calcium than other types of cheese, Greaves notes. Pick low-fat Swiss cheese and layer it on fiber-rich whole grain bread to help keep hunger at bay. Strawberries, blueberries, raspberries and other berries contain high amounts of low-calorie fiber. One cup of raspberries has 6 grams of fiber and just 60 calories. Sprinkle berries on your oatmeal for a double dose of fiber. Avoid berry jelly or jams, since they are typically loaded with sugar. Throw beans in soups, stews and salads to melt away belly fat. Beans are rich in fiber and protein, a potent hunger-preventing combination that helps keep your energy levels balanced longer. Opt for black or pinto beans. Avoid refried beans as they are loaded with saturated fat, causing your belly to expand, not shrink. The high-fiber and low-calorie content of all green veggies will help fill you up without filling you out, but asparagus has another advantage. "It's a natural diuretic, so eating it helps flush excess water from your body," explains Greaves. Less water weight means a flatter belly. Be sure to drink plenty of water to encourage a flat belly and abdominal area, too. Drink at least 8 glasses daily, along with 2 servings of green veggies a day. Mayo Clinic: Belly Fat in Women: How to Keep It Off!